Eunan O'Kane has earned a first senior call-up to an extended 37-man Republic of Ireland squad for the Euro 2016 qualifiers with Gibraltar and Georgia. The Bournemouth midfielder has featured in his side's Premier League defeats by Aston Villa and Liverpool this season. Uncapped duo, Brentford's Alan Judge and Adam Rooney of Aberdeen, are also named, while Preston defender Greg Cunningham makes a surprise return. Colorado's Kevin Doyle and Newcastle's Rob Elliott are recalled. Cunningham last played for the Republic in 2013. There is still no place for Crystal Palace centre-back Damien Delaney despite playing both their Premier League matches so far. The squad will be shortened before assembling for the double-header on the evening of 30 August. 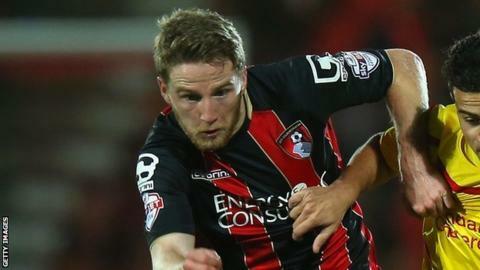 O'Kane, who played for Northern Ireland at youth level, joined Torquay United from Irish League club Coleraine in 2010, before joining Bournemouth two years later. The 25-year-old was named in the Republic of Ireland Under-21 squad for the first time in May 2012, after announcing the previous year that he was switching from Northern Ireland. O'Kane's club-mate Harry Arter, who made his debut in the friendly draw with England in June, is included despite missing the first two games of the Cherries' campaign as he recovers from hip and groin injuries. Martin O'Neill's side, who lie fourth in Group D after six matches played, travel to Portugal to play Gibraltar in Faro on 4 September, before hosting Georgia at the Aviva Stadium three days later. A draw with Scotland in Dublin in June put a dent in their hopes of qualification for France, but O'Neill has not given up hope of making the finals. "If we come out of these games with six points, it will be interesting to see how the table stands," said the Republic manager. O'Neill also indicated that young Aston Villa midfielder Jack Grealish was close to making a decision about his international future, being eligible for both England and the Republic of Ireland. "Jack is going to decide very shortly what he wants to do. He is a very good talent. It's a big decision to make," commented O'Neill. Republic of Ireland squad: David Forde (Millwall), Shay Given (Stoke), Keiren Westwood (Sheffield Wednesday), Darren Randolph (West Ham), Rob Elliot (Newcastle), Richard Keogh (Derby), Marc Wilson (Stoke), Seamus Coleman (Everton), Cyrus Christie (Derby), John O'Shea (Sunderland), Alex Pearce (Derby), Ciaran Clark (Aston Villa), Paul McShane (Reading), James McCarthy (Everton), Jeff Hendrick (Derby), Stephen Ward (Burnley), Greg Cunningham (Preston), Harry Arter (Bournemouth), Glenn Whelan (Stoke), Eunan O'Kane (Bournemouth), Aiden McGeady (Everton), James McClean (West Brom), Alan Judge (Brentford), Robbie Brady (Norwich), Anthony Pilkington (Cardiff), Stephen Quinn (Reading), David Meyler (Hull), Wes Hoolahan (Norwich), Robbie Keane (LA Galaxy), Shane Long (Southampton), Daryl Murphy (Ipswich), Jon Walters (Stoke), Kevin Doyle (Colorado Rapids), Anthony Stokes (Celtic), David McGoldrick (Ipswich), Adam Rooney (Aberdeen), Simon Cox (Reading).